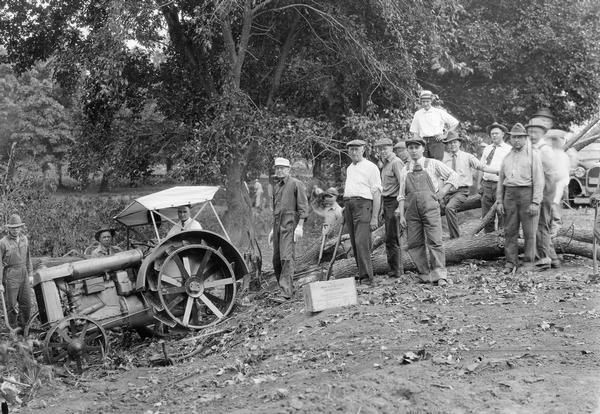 Original caption reads: "Members of Marshalltown Club at work on township road near Marshalltown, IA (1920). Over fifty members of the Club contributed a day's work to improving the road leading to town. For the privilege of giving this day's work, each volunteer paid $10 into the Club's special road fund, the money to be used in improving township roads, for which work the county road fund cannot be used. After these business men graded this piece of road, farmers graveled it. Thus a spirit of cooperation was established." The men are using a Fordson tractor.